250 pages | 32 B/W Illus. "This book is an impassioned intervention in a changing European and modern political culture. It re-enchants the everyday, the grass-roots, the familial-feminine, and the concrete in unique and important ways…and proposes a new public anthropology of broad use refocused on the sensorium that emerges from the traumatic in everyday life. Drawing on her own continuing fieldwork and cultural participation in Greece, as well as elsewhere in Europe and the US, and inspired by Adorno, Taussig, Benjamin, Foucault, de Certeau, and other critics of a flattening, disembodying modernity, Seremetakis engages the politics of EU "management" and other practices of "modern development" with sensitive attention to their effects on ordinary people living everyday lives. The observations found in this book are rich and exciting, and the interpretations advanced are unpredictably open-minded." "This book is marked by a heterogeneity of micrological ethnographic sites cut across by recurrent themes…such as the spatialization of sensory experience and memory, the critique of the axis of Dominant and Archaicized culture (as formulated by Raymond Williams), a counter concern with Residual and Emergent cultural forms excluded from that axis, and a unique philological approach to sensory experience through an archeology of vernacular language. This framework generates fascinating insights on cultural heritage as sensory archives in relation to the museumification of Greece which is in direct communication with its current debt collapse. …Powerful is also the author’s analysis of rumor as an element of corruption and deceit of Greek public culture." 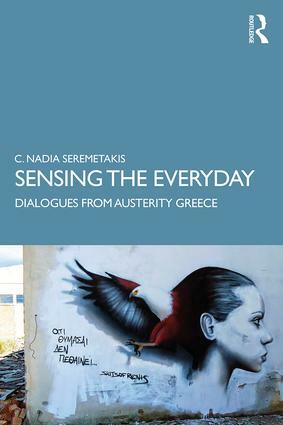 "A major work that will certainly be discussed and become a reference point for many years …It reveals Seremetakis as an ethnographer of the everyday, strolling the world like a modern day flaneur, with her eyes open for telling details that are then woven into extraordinary anthropological analyses of diverse topics ….that add up to "the study of the quotidian in process." Her ruminations…exquisitely and sensitively observed and poignant beyond words, reveal also that she has not stopped thinking on pain and death, just gotten better at it…. This is Seremetakis at her finest." 5. Wounded Borders: The Arrival of the "Barbarians"
C. Nadia Seremetakis is Professor of Cultural Anthropology at the University of the Peloponnese, Greece. She has authored several acclaimed books and articles in English and Greek, including poetry, and has been actively engaged in public anthropology in both Europe and the USA, where she lived and taught for more than two decades.